Starting from today, we a group of bloggers are into month-long marathon cooking International Cuisine. If you are a regular reader here, then you must remember Indian Food Odyssey, a month-long marathon covering all Indian States, yes like that it is now International Cuisine and named as Around the world in 30 days! Coming to today's Cuisine we start with A and i chose to cook from Afghanistan. Why Afghan? Well, it is our Neighboring country and secondly i wanted to try out the vegetarian meal options available in these countries, where we think only chicken and mutton dominate. According to Wiki: The varied climate of Afghanistan allows for an abundance of crops throughout the seasons. Fresh yogurt, coriander, garlic, onions, spring onion, tomatoes, potatoes and fruit are widely available in all parts of Afghanistan, and are used in preparing foods. Fruits and vegetables, fresh and dried, form an important part of the Afghan diet, especially in the rural areas. Afghanistan produces a variety of fruits, notably grapes, pomegranates, apricots, berries and plums. Bolani is a vegan flat-bread from Afghanistan, baked or fried with a vegetable filling. 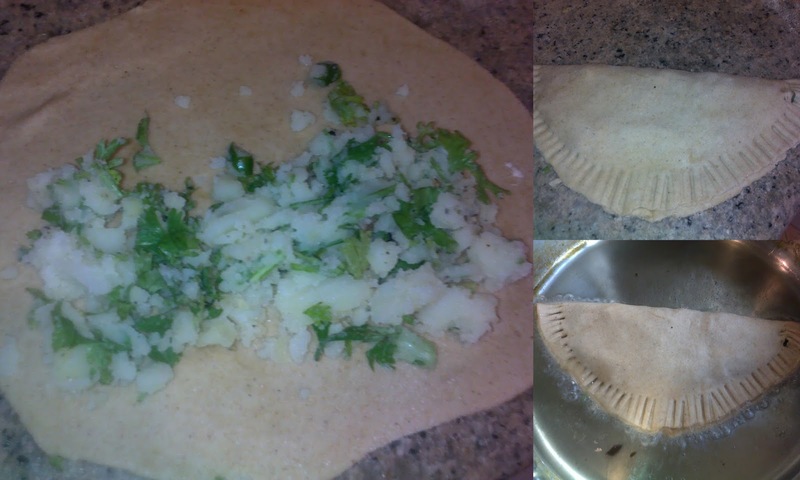 It has a thin crust and can be stuffed with a variety of ingredients, such as potatoes, spinach, lentils, pumpkin, or leeks. It can be served with plain yogurt or mint yogurt. Add water to this and slowly start kneading to make the dough. Add oil finally to get a smooth and soft dough. Peel, chop and cook the Potatoes soft. i used Microwave Auto-cook menu to cook the potatoes. Let it cool, drain the excess water. Mash the potatoes, add the rest of ingredients to it. Mix well and set aside until use. Mix all the ingredients together, keep aside until use. Divide the dough into 6-7 pieces. Flour the surface well and roll out the dough round and thin. Just before servig, mix together all the ingredients together to make a smooth dip.Serve it along any flat-bread. Bolani freezes well. Freeze it uncooked. I tried and froze 2 pieces of Potato bolani and 2 pieces of pumpkin bolani. I tried using All Purpose flour and also Wheat flour for this recipe. Both turned out well. Even Multi-grain flour tastes good. The amount of spice and variety in the filling is one's own choice. So, go ahead, experiment. Bolani can also be cooked on tava, just like our paratha. If calorie conscious, try cooking tava with less oil. Afghanistan is the star of the Day! !..well the Bolani is quite like our Aaloo paratha, just that the folding is different..right?..but I love the way you have put those incisions, makes it look so pretty. anyways, brilliant start to the BM Priya ! a fanstastic job on the Bolani !! and I like the twist in the design..
Baloni looks a lot like aloo paratha with a fold. Delicious! Awesome start to the bm. Great start Priya! Like both the fillings you have used. Bolani has browned so well. Very appetizing. They look so pretty Priya and am sure they tasted great too:). And as Vaishali said, Afgani dishes are the stars of the day!!! Good one, Priya. Loved both the fillings. I should try the pumpkin filling. Sounds very interesting. Bolani makes me hungry, looks very crispy and beautifully browned..want to give a try very soon. These became one on my list of to do dishes after seeing many of you posting it. A yummy and filling bolani. Bolani looks too good, so much like our own aloo paratha. Love the flavors in pumpkin bolani too. So many Afghani recipes for the day I like the stuffing and minty dip perfect combo. Yummy dish.. The shape looks similar like mexican empanadas. yum. Looks so cute. Love the way you have done two fillings. Bolani sounds so much like our stuffed parathas.. Same pinch Priya!! I love your use pf pumpkin in the bolani must have tasted awesome.